With the large amount of people buying and selling guitars on the web, i've found that quite a few of them could use some help in the area of preparing a guitar for the sometimes rough ride it can get in shipping around the country and also around the world. A '56 les paul and a $69 dollar starter ax all look the same to the delivery guy when the box is on the truck. It's just another box. And a big one too. If you want it to get there in one piece you gotta do a couple of things right. Brown Packing Tape. It doesn't have to be the reinforced with fiber stuff. The regular garden variety brown is fine. Preferably 2 inches wide. A Full Size Newspaper. Do not use color magazines. Try to use only black and white newsprint type paper. It crumples up better and gets in the corners. Generally color paper has a finish on it and doesn't crumple, it creases. If you know you're gonna have to ship a guitar beforehand start saving those 'sunday papers', those are the ones you're gonna want to use. You can substitute 'bubble wrap' if you have it for the padding on the inside of the guitar case if you like. It works really well but it costs more than newspaper. A Proper Box. By that i mean, get a guitar box. Get one from a music shop in your local area. Get one any way you can, but get one. It's the easiest, safest, and will give you the best results. If you know you're gonna have to ship a guitar, call your local shop and ask for a box even before your guitar is ready to ship. I've found it can take even a music store about a week before they could give me a box. Plan ahead. If you can't find a guitar box, but you gotta try, then go to a moving and storage place and get a garment box. They don't cost much and they work. It's not as good as a guitar box but it's close. If you go the garment box method cut the box in half the long way so the guitar won't be floating around in that big box. Try to get the box about 8 inches deep approximately, then securely tape it together as one box. Don't cut the box apart now, just slip one side into the other and tape it up. OK! Clean the guitar. remember, this is going to someone who paid money for it. you're glad you got the money, right? now, make them glad they got your guitar. Check the guitar for weird stuff like loose screws, missing stuff, any other odd things you may not have seen and fix 'em. Loosen all the strings. really loosen them up. so they are just layin' on the fingerboard. stuff happens in shipping that none of us know about. but the extra tension on the neck doesn't need to be there, i'm sure of that. Align all tuning keys parallel with the headstock. it makes it easier to fill the headstock area with crumpled paper. If the guitar has a tremolo bar remove it and wrap it separately and pack it in the case in the accessory section, if not put it up by the headstock. Mark it so the new owner will know it's there! Just lay the guitar in the case and move it around. Is it flopping around or is it tight? Let it sit in the case the way it wants to be then fill in the areas that are open. If it's jiggling then fill in the jiggly areas with long single pages. DO NOT fill the case with paper and then put the guitar in. With a most guitars you'll have to fill in around the headstock and slightly support under the neck where the neck meets the body. Remember, you're using single sheets here not big clumps of paper. What you want to do is SUPPORT THE GUITAR. don't jam the case up with paper. ok, close it up! don't force it, just close it. if you gotta force it you've got too much paper in there. take some out until it closes properly. Tape the handle of the case down. It'll jiggle in shipping and sounds horrible after you're all done and you lift the box and hear it, you'll swear one of the pickups fell out and you'll kick yourself. Might as well tape the locks too. It can't hurt. Special Instructions for Guitars with No Case! First cover the whole guitar with plastic or paper bags. It's not pretty but it will keep the bubble wrap from bursting on the sharper edges of the guitar. It is my strong recommendation to wrap the whole guitar in bubble wrap. Multiple layers in different directions. Don't skimp here. It will pay off later. Think of a 'mummy'. That's what you're trying to go for with the wrapping. If you can't get bubble wrap then wrap the guitar in a plastic bag or paper and tape it closed. then, fill plastic garbage bags with crumpled paper and wrap them around the guitar. tape 'em up good. you're ready to move on with the group now! Let's Box This Baby Up! Grab about 8 to 10 sheets of paper and twist in the shape of a figure eight. It'll be thick and clumpy but that's good. Fill up about 1/3 of the box with paper. Now set the guitar inside the box. Put it in the middle of the box. You should have some room on both sides to fill with crumpled paper. 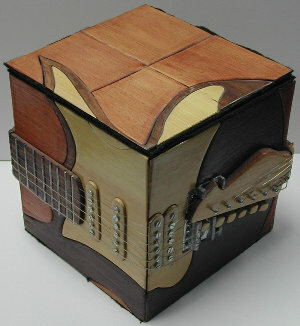 Make sure the guitar is "headstock facing up"
Fill in the rest of the box with the 8-10 sheet style crumpled paper. All the way to the top so it's slightly overflowing with paper and then close the box. you should have a nice snug fit. Again, don't jam it up, let the paper do the work. Now get that brown tape and tape the edges of the box closed. Then do it again. Right, tape it twice. Stuff happens, right! lookin' good so far, you're almost done. Assuming you have a brown box make a name label out of 'white' paper for the guitar recipient and one for you the sender. Why? because you, the sender have to put your label with your whole name and address and zip and whatnot on the upper left hand corner and the 'recipient' label gets put on the right hand side in about the middle, that's why. Double check that you spelled EVERYTHING right. Tape the labels to the "top" of the box. Not the sides or bottom. TO THE TOP. You might want to invest in a roll of clear tape and tape over the whole label. It does rain in some parts of the world and chances of it raining on your guitar are pretty good. especially if you don't tape it. Again, stuff happens. Make some snazzy looking arrows on the sides of the box 'pointing up' then write under the arrows 'THIS SIDE UP'. do that on both sides of the box. Also write on the sides of the box "FRAGILE, HANDLE WITH CARE, PLEASE". The big word here is PLEASE. don't leave it out. it works. Call the shipping guy. I'm not recommending here. I'll tell you who's pretty good and i'll tell you who i've had bad luck with. The rest i'll have to leave to you. I use 'UPS' and so far i've had no problems. I've had guitars shipped to me, improperly packed by the seller, by the U.S. Mail and they have arrived in pieces. Me, i don't send guitars U.S. Mail unless i absolutely have to or if someone specifically asks me to. Here's why. If the guitar is damaged in shipping U.S. Mail it will take up to six months to get your money back if the U.S. Mail decides it was damaged in shipping. if they decide otherwise i would imagine it would take longer. You get the idea. UPS is far more understanding about this stuff. If you have a problem with shipping they will rectify it in about 3 to 5 days usually. At least they did for me. Like i said, i'm not recommending anyone, choose your best guy but be sure to insure the instrument for the full amount the buyer paid, that way if their is a problem at the very least they can get their money back. Hopefully, in a timely manner. If you do ship 'ups' make sure you get the 'tracking number' after you leave the guitar with them. that way you can follow it all the way to its destination and have a good idea when it will arrive. Email the receiver and let 'em know the guitar is on the way. Or call or whatever. That way they can keep an eye out for it. People really appreciate when you do this. It's considerate and shows a professional touch. Have the receiver contact you to make sure the guitar arrived ok. If it does, then you can consider that your part of the deal is now done. Congratulations, it got there in one piece!